The Grand Lodge of Hawaii’s 3rd Annual Leadership Workshop will be held on Saturday, September 17, 2016 from 8 am to 3:30 pm at the Honolulu Masonic Temple. 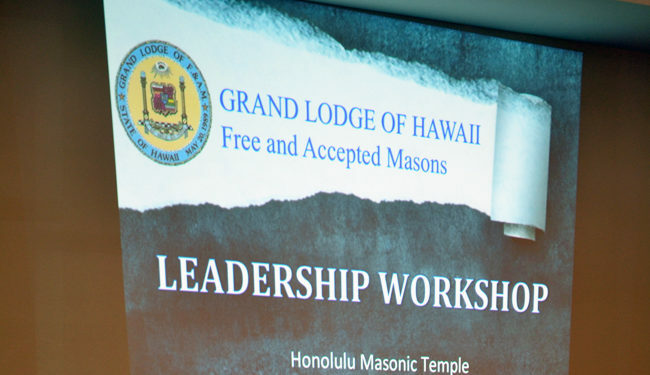 Grand Lodge of Hawaii workshops are designed to provide those in attendance with the tools to help prepare them to be proactive and effective in our Lodges; not only for their years as a lodge officer, but for the continued growth and viability of our Lodges future. The registration fee for this workshop will be $35 and is open not only to Lodge Officers but to any member of our jurisdiction who is considering taking a more active role in the lodge in the future. Attendance will be limited to the first 35 to register as we have to work within the space we have chosen for this workshop.